Official Yamaha rider Adrien Van Beveren stormed to a dominant victory on stage four of the 2018 Dakar with a winning margin big enough to jump from seventh to take the overall lead. The 26 year old Frenchman first entered the Dakar in 2016 finishing sixth at his first attempt. In 2017 he finished fourth and is fast establishing himself as one of the sports elite riders. Having started on the second wave of mass starts – five minutes behind the first 15 bikes, Van Beveren and official HRC rider Joan Barreda started fast to close down the group ahead. Towards the end of the stage there was a difficult Way Point to find with over 15 riders lost, all trying to locate it. 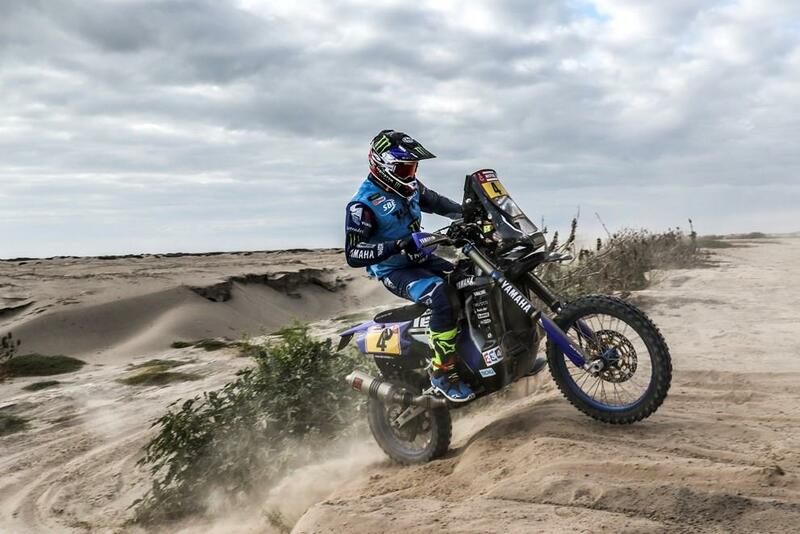 But it was Van Beveren who did so first and as a result opened up a huge advantage to win the stage from his Yamaha teammate Xavier De Soultrait by 5m 01s. KTM factory rider Matthias Walkner finished third. Speaking to MCN, Van Beveren was more concerned about his close friend and training partner, Sam Sunderland who crashed out of Dakar, than his stage victory and on returning to the bivouac went straight to the medical tent to see how he was. Van Beveren said: “Sam told me that crashed and then he started again. But when he felt his leg going to sleep he was worried there was something bad and he had to stop. He can move both his legs ok, but it is painful. Now he is on his way to Lima. Hopefully he is OK.
Van Beveren now has the un-enviable task of starting stage 5 first, but having shown his ability to be so fast even when opening the track and navigating with no one to follow, he seems unfazed.